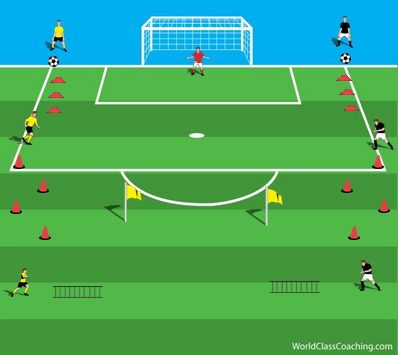 Station one – Dribble through the cones using the inside of feet only. Station two – Dribble through the cones using the sole of feet only. Station three – Pass the ball towards the end of the ladder, perform quick feet movements through the ladder and collect the ball again at the end. When completing station three, the player must make a move and take a touch to either side of the flag and shoot as quickly as possible. Above we see player one and two have finished their stations and have returned to the beginning, player three is in the process of taking his shot (yellow team). This game will be played in high tempo bursts. Playing through from the first whistle until a player takes a shot. A way to extend the game is by having the players rotate with every shot, the first team to get all players back into the same starting positions wins. You can vary/change each station. You could even change the techniques used to get through each station. Add in stations to accommodate for more players. I hope you enjoy the exercise! Looks like a fun drill that can keep moving at a good pace. I just started incorporating ladders in my circuits and our U10 girls team loves it. I will definitely add this to the repertoire. Great stuff!!! this is not real shooting drill> This is not real soccer Training. I will never including these marks and coins and ladders in side the training Area, these Tools should be outside the training area.I am Sorry this is my Philosophy. I like it. Having fun while working on many aspects. This does not represent real life match and therefore no game resistance. Otherwise known as the isolated approach because it removes realism out of a real game situation.